Includes 30+ replay able activities and 25+ reward stickers. Please note: A PC/MAC with a USB port is required to download audio files for each activity book. 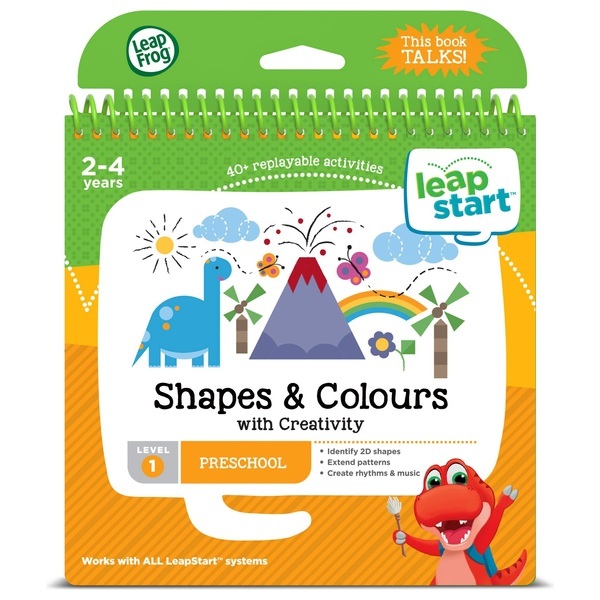 LeapFrog LeapStart Nursery Activity Book: Shapes, Colours & Creative Expression is an interactive, activity book that talks, sings and comes to life with 30+ replay able activities and key skills covering the Nursery fundamentals of Shapes & Colours and Creativity. Visit a prehistoric world filled with dinosaur friends and get familiar with all sorts of shapes and colours. Tap keys to unlock secret mystery boxes with Ty the T-Rex, trace objects to learn how to draw shapes and even "build" your own car. Create your own music tunes for a totally rocking dinosaur dance party, and go on a colossally cool shape- finding adventure. Finish up the fun by searching for different shapes hidden in a kaleidoscope. With this LeapStart book, kids explore 14 skills focused on shapes, colours and creativity, including identifying and extending patterns, recognising shapes, learning about primary and secondary colours, creating rhythms and more. The book is designed to engage kids through activities music, games, learning and vibrant visuals. Most activities are designed with two levels so kids can play and learn at the right level and then advance when they’re ready. As kids master a new skill, they’re prompted to place one of the included stickers (more than 25 in all) on the reward page to celebrate their accomplishment and motivate them to learn more!